Start your New Year right and make your 1st Night, 3 Nights! 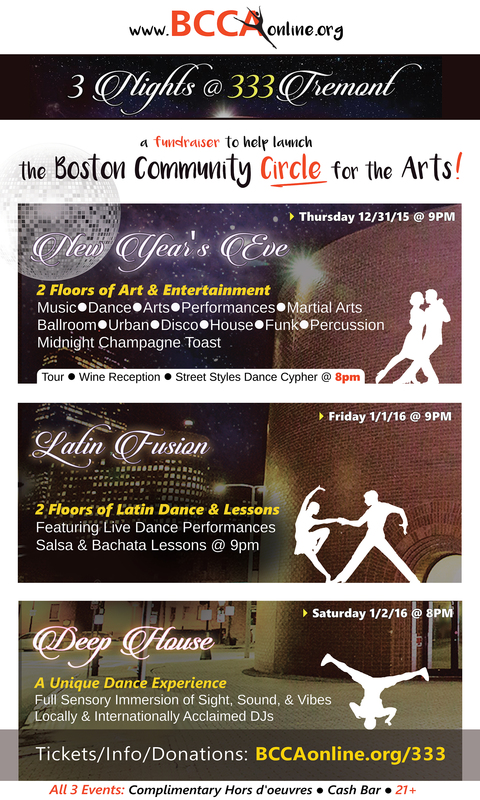 Be a part of launching the Boston Community Circle for the Arts in the heart of Boston's Theatre District! Break The Silence! Foundation (BTS-Foundation), Brookline Community Center for the Arts (BCCA), Boston Music Conference (BMC), Genuine Voices, and Boston Music Coalition (BMC), and Diane Purdy's Children's Theatre Workshop (CTW), have joined together for the purpose of opening an Arts Center in Downtown Boston to help both inner-city kids & aspiring professionals alike discover their talents with the use of mentoring, workshops, and classes along with the connections they have all made from working in the entertainment industry! 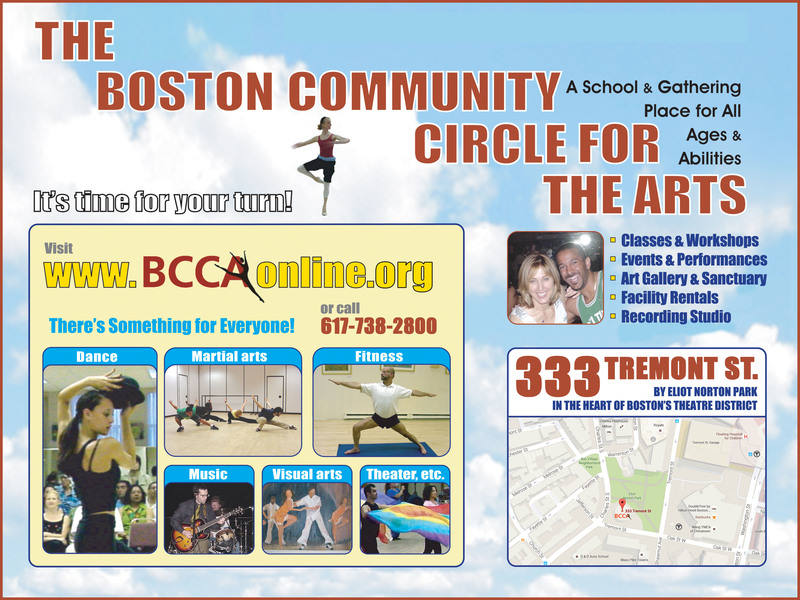 The Greater Boston Community Center for the Arts (BCCA, Inc.) – Read our combined mission! Share Our Stage 2010 is a once in a lifetime event that will include a star-studded two-day entertainment lineup, to benefit the creation of the new BCCA in Downtown Crossing, Boston – The Phoenix Rising of the former Coolidge Corner, Brookline based center that closed its doors in May of 2005, having served over 7,500 community members with 170 classes/week & 500 events/year, conducted by its diverse resident faculty & visiting artist body of 350. The Saturday, June 19th, 1 p.m. matinee at John Hancock Hall, will present the Official US East Coast Premier & Celebrity Red Carpet of "Elle: A Modern Cinderella Tale", a music-driven Disney cast film, starring Ashlee Hewitt , Sterling Knight, & Kiely Williams, fresh off it's “Best Family Film” award at the Newport Beach Festival, & success at Cannes, a live performance by the hit Urban-Pop group My Hero, from the Film's Soundtrack, & 11:30 a.m. Red Carpet celebrity photo-ops. The 7 p.m. evening show “An Evolution of the Blues”, a first rate performance, will feature performances by multi-Grammy award winning artist & actor, Chris Thomas King, King of 21 st Century Blues, & his band – Darryl White on Drums & Roland Guerin on Bass, Urban-Pop group My Hero, 7-time Grammy nominated blues band Bellevue Cadillac, music & dance by Genuine Voices & Boston Tap Company, celebrity appearances (including Vinny Vella co-star in “Casino”, “Sopranos”, Etc. ), fun MC's & acclaimed pianist Richard DeMone, & a 5:30 p.m. VIP reception with the events performers, designer goodie bags from S1 ~ Safety First, & complimentary hors d'œuvres, beer & wine, at the Back Bay Grand. B.Good Burger will be onsite all day to provide complimentary treats & healthy shakes for the kids who attend shows. VIP ticket holders will be treated to a taste of Boston's finest nightlife, including a Friday, June 18 th 6-10 p.m. pre-event VIP reception at the House of Blues Boston Foundation Room, featuring appearances by Chris Thomas King, My Hero, special guests the Bobby Keyes Trio, & DJ Aeryn, complimentary hors d'œuvres & beverages from 6-7 p.m., & a live auction – 50% of the proceeds to benefit the International House of Blues Foundation (IHOBF). Splash Ultra Lounge will host a June 18 th 7-10 p.m. VIP reception featuring complementary hors d'œuvres, appearances by My Hero, & music by DJ Joe Sobalo Jr.
To top off this incredible weekend, VIPs, sponsors, media, & affiliates will enjoy a festive after party on June 19th 9:30 p.m.-1 a.m. at Mantra Restaurant, our Title Sponsor for Share the Stage 2010, bringing together all the weekend's performers, for schmoozing, impromptu performances, music by DJ Aeryn & virtuoso Flamenco Guitarist Juanito Pascual, & the exquisite atmosphere & dining of Mantra. Mass Magic will dazzle people with close-up magic throughout the festivities. Share Our Stage 2010 – 2 Days of Exquisite Celebrity Entertainment & the Best of Boston! June 19th Matinee tickets are $20 (Reserved) & $30 (VIP), and Evening tickets are $35 & $50 (Reserved), & $100 (VIP), with discounts offered to children, students, seniors, service people, union members, and affiliated organizations. For complete event details & exclusive VIP tickets purchases (until they sell out! ), visit www.bccaonline.com/shareourstage.html. For Reserved (non-VIP) seating visit http://www.tillingers.com/shareourstage or call 1(877) 548-3237. For accessible seating call (617) 572-9122.